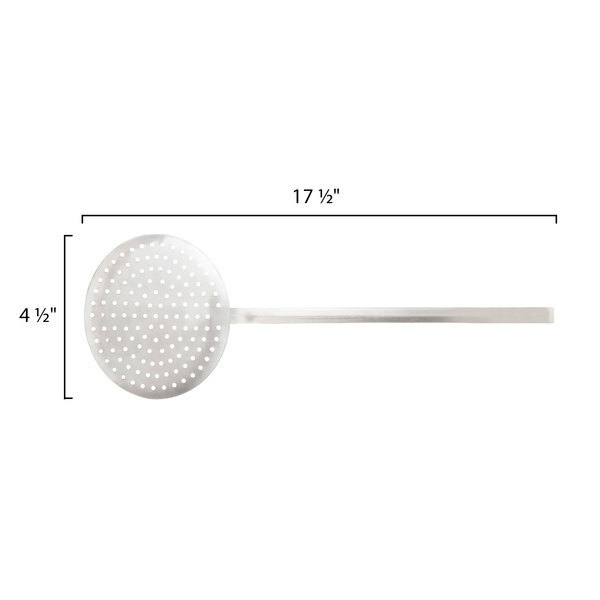 Quickly and efficiently skim the surface of cooking liquids with this 4 1/2" diameter two-piece skimmer! 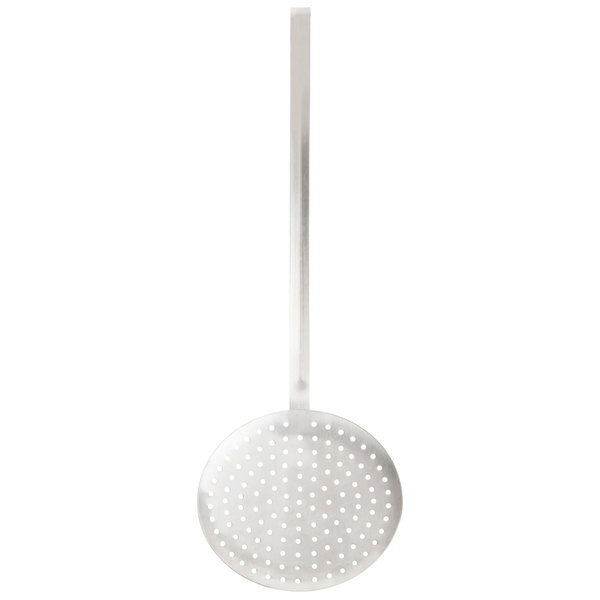 This flat, sieve-like spoon features a long, rigid, hooked handle with a low heat-transferring design. The skimmer as a whole is easy to clean and durable, too, for longevity in your commercial kitchen. 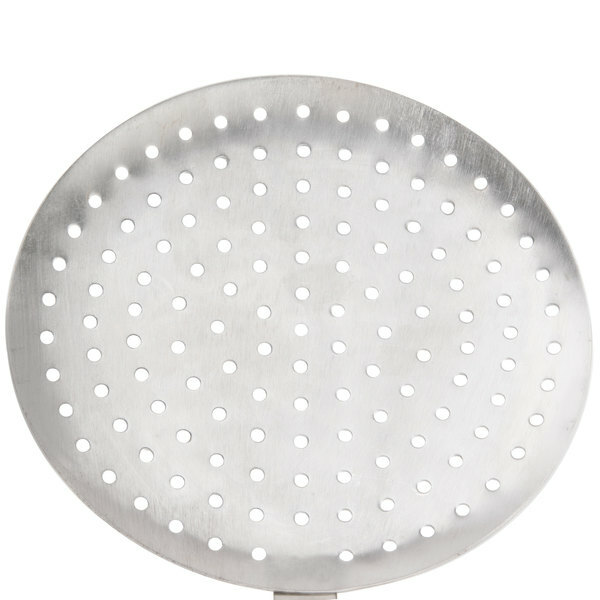 Use this skimmer to skim solid seasonings, such as bay leaves, out of your soups, stews, sauces, and more. 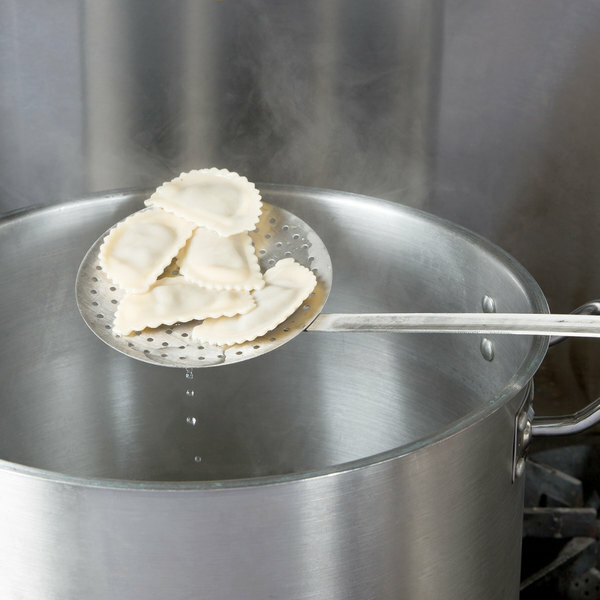 Anything that floats to the top of your culinary creations (that you don't want to be there) will be skimmed with ease thanks to this handy kitchen tool. Plus, thanks to its convenient hang hook, this skimmer can be stored out of the way, yet easily-accessible, when not in use. Very large skimmer. 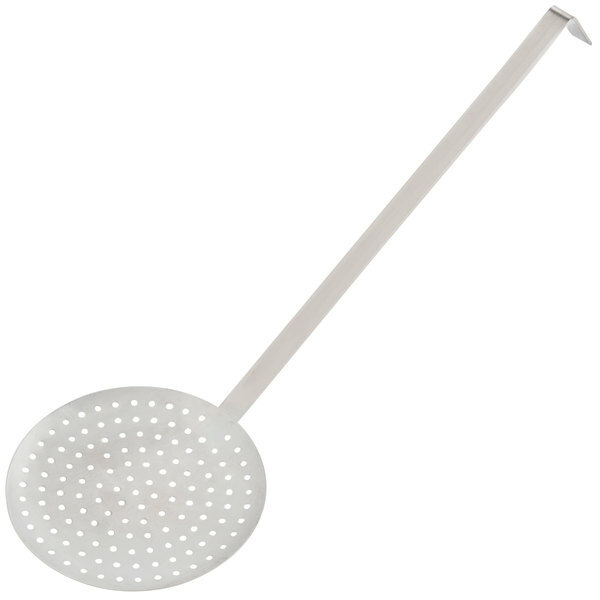 This round two piece skimmer will work well for use with large stock pots. 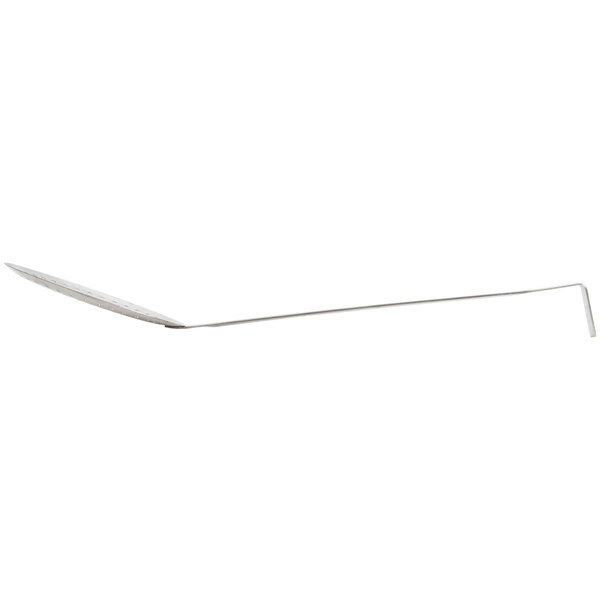 While the skimmer doesn't have a hole to hang from a hook, the 'hook' on the end does allow it to hang from the horizontal bar on a stainless steel wire rack. This is a really great skimmer at a fantastic price. 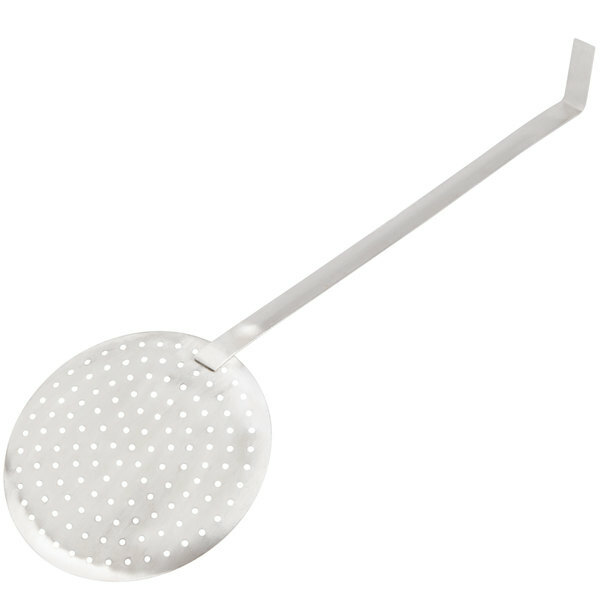 We use this skimmer to remove bagels from their malt bath and its size comes in really handy. In the past we've used fish turners and the bagels had a tendency to fall back in and splash everywhere. This is a very sturdy and reliable tool. Wow. This is a lovely and well-crafted tool for so little money. I used to have a similar one that my grandmother brought from Europe, but years ago it "walked" away. I was SO delighted to find this - thanks Webstaurant. A very good tool for skimming big pots of stock. The skimmer is made of two pieces and is sturdy. Best of all, it's very easy to clean. The handle isn't the most comfortable in the hand, but it's large head size means you won't be using it for too long at a time. My chef loves this. It's perfect for our poached eggs. Good construction. Seems like it will last a long time for us. Will deinifitely buy again. I bought this skimmer for decorational purpose: so that my kitchen would look better, and had no intentions of using it. But when I started to marinading meat, it came in handy by draining out the fluids from the solids in the small cup-like plastic deli containers. It is simple and effective. The price is cheap and the value is very good.